Proprietary Name: Droxia What is the Proprietary Name? Droxia with NDC 0003-6336 is a a human prescription drug product labeled by E.r. Squibb & Sons, L.l.c.. 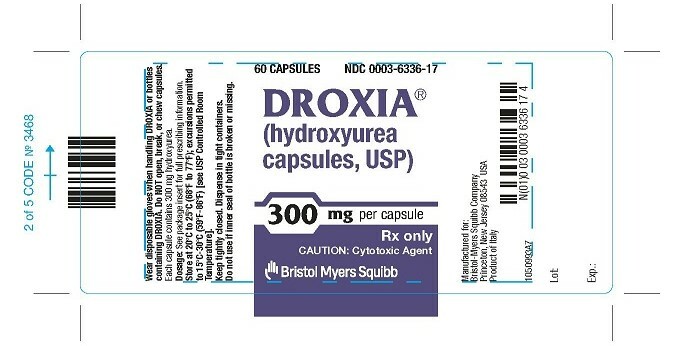 The generic name of Droxia is hydroxyurea. The product's dosage form is capsule and is administered via oral form. Myelosuppression: DROXIA may cause severe myelosuppression. Monitor blood counts at baseline and throughout treatment. Interrupt treatment and reduce dose as necessary [see Warnings and Precautions (5.1)].Malignancies: Hydroxyurea is carcinogenic. Advise sun protection and monitor patients for malignancies [see Warnings and Precautions (5.2)]. Table 1: Dosing Recommendation Based on Blood CountDosing RegimenDoseDose Modification CriteriaMonitoring ParametersInitial RecommendedDosing15 mg/kg/day as a single dose once daily based on the patient’s actual or ideal weight, whichever is less. Monitor the patient’s blood count every 2 weeks [see Warnings and Precautions (5.1)].Dosing Based on Blood Counts In an acceptable rangeIncrease dose5 mg/kg/day every 12 weeksMaximal dose:35 mg/kg/day**Maximal dose is the highest dose that does not produce toxic blood counts over 24 consecutive weeks.Increase dosing only if blood counts are in an acceptable range.Do not increase if myelosuppression occurs.Blood Counts Acceptable Rangeneutrophils ≥2500 cells/mm3platelets ≥95,000/mm3hemoglobin >5.3 g/dLreticulocytes ≥95,000/mm3 if the hemoglobin concentration <9 g/dL Between acceptable and toxic rangeDo not increase dose.If blood counts are considered toxic, discontinue DROXIA until hematologic recovery.Blood Counts Toxic Rangeneutrophils <2000 cells/mm3platelets <80,000/mm3hemoglobin <4.5 g/dLreticulocytes <80,000/mm3 if the hemoglobin concentration <9 g/dLDosing After Hematologic RecoveryReduce dose by2.5 mg/kg/day.Reduce the dose from the dose associated with hematologic toxicity.May titrate up or down every 12 weeks in 2.5 mg/kg/day increments.The patient should be at a stable dose with no hematologic toxicity for 24 weeks.Discontinue the treatment permanently if a patient develops hematologic toxicity twice.Patients should swallow DROXIA capsules whole and not to open, since hydroxurea is a cytotoxic drug. Patients must be able to follow directions regarding drug administration and their monitoring and care.Fetal hemoglobin (HbF) levels may be used to evaluate the efficacy of DROXIA in clinical use. Obtain HbF levels every three to four months. Monitor for an increase in HbF of at least two-fold over the baseline value.DROXIA causes macrocytosis, which may mask the incidental development of folic acid deficiency. Prophylactic administration of folic acid is recommended.DROXIA is a cytotoxic drug. Follow applicable special handling and disposal procedures [see References (15)]. Reduce the dose of DROXIA by 50% in patients with creatinine clearance of less than 60 mL/min or with end-stage renal disease (ESRD) [see Use in Specific Populations (8.6) and Clinical Pharmacology (12.3)]. Creatinine clearance values were obtained using 24-hour urine collections. * On dialysis days, administer DROXIA to patients with ESRD following hemodialysis.Creatinine Clearance(mL/min)Recommended DROXIA Initial Dose(mg/kg once daily)≥6015<60 or ESRD*7.5Monitor the hematologic parameters closely in these patients. Hydroxyurea causes severe myelosuppression. Treatment with hydroxyurea should not be initiated if bone marrow function is markedly depressed. Bone marrow suppression may occur, and leukopenia is generally its first and most common manifestation. Thrombocytopenia and anemia occur less often, and are seldom seen without a preceding leukopenia.Some patients, treated at the recommended initial dose of 15 mg/kg/day, have experienced severe or life-threatening myelosuppression.Evaluate hematologic status prior to and during treatment with DROXIA. Provide supportive care and modify dose or discontinue DROXIA as needed. Recovery from myelosuppression is usually rapid when therapy is interrupted. Based on the mechanism of action and findings in animals, DROXIA can cause fetal harm when administered to a pregnant woman. Hydroxyurea was embryotoxic and teratogenic in rats and rabbits at doses 0.8 times and 0.3 times, respectively, the maximum recommended human daily dose on a mg/m2 basis. Advise pregnant women of the potential risk to a fetus [see Use in Specific Populations (8.1)].Advise females of reproductive potential to use effective contraception during and after treatment with DROXIA for at least 6 months after therapy. Advise males of reproductive potential to use effective contraception during and after treatment with DROXIA for at least 1 year after therapy [see Use in Specific Populations (8.1, 8.3)]. Avoid use of live vaccine in patients taking DROXIA. Concomitant use of DROXIA with a live virus vaccine may potentiate the replication of the virus and/or may increase the adverse reaction of the vaccine because normal defense mechanisms may be suppressed by DROXIA. Vaccination with live vaccines in a patient receiving DROXIA may result in severe infection. Patient’s antibody response to vaccines may be decreased. Consider consultation with a specialist. The following adverse reactions are described in detail in other labeling sections: •Myelosuppression [see Warnings and Precautions (5.1)] •Malignancies [see Warnings and Precautions (5.2)] •Embryo-fetal toxicity [see Boxed Warning and Warnings and Precautions (5.3)] •Vasculitic toxicities [see Warnings and Precautions (5.4)] •Risks with concomitant use of antiretroviral drugs [see Warnings and Precautions (5.6)] •Macrocytosis [see Warnings and Precautions (5.7)]Because clinical trials are conducted under widely varying conditions, adverse reaction rates observed in the clinical trials of a drug cannot be directly compared to rates in the clinical trials of another drug and may not reflect the rates observed in practice. In 299 patients treated for sickle cell anemia in the Multicenter Study of Hydroxyurea in Sickle Cell Anemia, the most common adverse reactions were hematologic, with neutropenia, and low reticulocyte and platelet levels necessitating temporary cessation in almost all patients. Hematologic recovery usually occurred in two weeks.Other adverse reactions include hair loss, macrocytosis, bleeding, and melanonychia. The following adverse reactions have been identified during post-approval use of hydroxyurea in the treatment of neoplastic diseases. Because these reactions are reported voluntarily from a population of uncertain size, it is not always possible to reliably estimate their frequency.Reproductive System and Breast disorders: azoospermia, and oligospermiaGastrointestinal disorders: stomatitis, nausea, vomiting, diarrhea, and constipationMetabolism and Nutrition disorders: anorexiaSkin and subcutaneous tissue disorders: maculopapular rash, skin ulceration, dermatomyositis-like skin changes, peripheral and facial erythema, hyperpigmentation, nail hyperpigmentation, atrophy of skin and nails, scaling, violet papules, and alopeciaRenal and urinary disorders: dysuria, elevations in serum uric acid, blood urea nitrogen (BUN), and creatinine levelsNervous system disorders: headache, dizziness, drowsiness, disorientation, hallucinations, and convulsionsGeneral disorders: fever, chills, malaise, edema, and astheniaHepatobiliary disorders: elevation of hepatic enzymes, cholestasis, and hepatitisRespiratory disorders: diffuse pulmonary infiltrates, dyspnea, and pulmonary fibrosisHypersensitivity: Drug-induced fever (pyrexia) (>39°C, >102°F) requiring hospitalization has been reported concurrently with gastrointestinal, pulmonary, musculoskeletal, hepatobiliary, dermatological or cardiovascular manifestations. Onset typically occurred within 6 weeks of initiation and resolved upon discontinuation of hydroxyurea. Upon re-administration fever re-occurred typically within 24 hours. DROXIA can cause fetal harm based on findings from animal studies and the drug’s mechanism of action [see Clinical Pharmacology (12.1)]. There are no data with DROXIA use in pregnant women to inform a drug-associated risk. In animal reproduction studies, administration of hydroxyurea to pregnant rats and rabbits during organogenesis produced embryotoxic and teratogenic effects at doses 0.8 times and 0.3 times, respectively, the maximum recommended human daily dose on a mg/m2 basis (see Data). Advise women of the potential risk to a fetus and to avoid becoming pregnant while being treated with DROXIA.In the U.S. general population, the estimated background risk of major birth defects and miscarriage in clinically recognized pregnancies is 2%–4% and 15%–20%, respectively. DROXIA can cause fetal harm when administered to a pregnant woman [see Use in Specific Populations (8.1)]. Advise females of reproductive potential to use effective contraception during and after treatment with DROXIA for at least 6 months after therapy. Advise females to immediately report pregnancy. DROXIA may damage spermatozoa and testicular tissue, resulting in possible genetic abnormalities. Males with female sexual partners of reproductive potential should use effective contraception during and after treatment with DROXIA for at least 1 year after therapy [see Nonclinical Toxicology (13.1)]. Based on findings in animals and humans, male fertility may be compromised by treatment with DROXIA. Azoospermia or oligospermia, sometimes reversible, has been observed in men. Inform male patients about the possibility of sperm conservation before the start of therapy [see Adverse Reactions (6) and Nonclinical Toxicology (13.1)]. 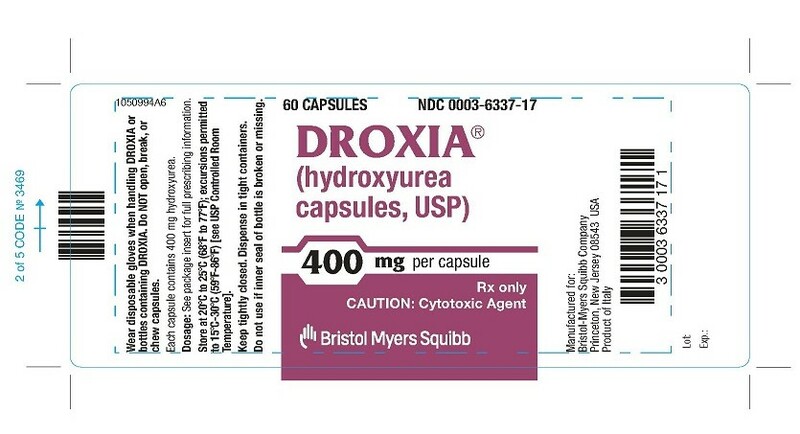 Clinical studies of DROXIA did not include sufficient numbers of subjects aged 65 and over to determine whether they respond differently from younger subjects.Elderly patients may be more sensitive to the effects of hydroxyurea, and may require a lower dose regimen. Hydroxyurea is excreted by the kidney, and the risk of adverse reactions to this drug may be greater in patients with impaired renal function. Because elderly patients are more likely to have decreased renal function, care should be taken in dose selection, and it may be useful to monitor renal function [see Dosage and Administration (2.2)]. The exposure to hydroxyurea is higher in patients with creatinine clearance of less than 60 mL/min. Reduce dosage and closely monitor the hematologic parameters when DROXIA is to be administered to these patients [see Dosage and Administration (2.2) and Clinical Pharmacology (12.3)]. The precise mechanism by which hydroxyurea produces its cytotoxic and cytoreductive effects is not known. However, various studies support the hypothesis that hydroxyurea causes an immediate inhibition of DNA synthesis by acting as a ribonucleotide reductase inhibitor, without interfering with the synthesis of ribonucleic acid or of protein.The mechanisms by which DROXIA produces its beneficial effects in patients with sickle cell anemia (SCA) are uncertain. Known pharmacologic effects of DROXIA that may contribute to its beneficial effects include increasing hemoglobin F levels in red blood cells (RBCs), decreasing neutrophils, increasing the water content of RBCs, increasing deformability of sickled cells, and altering the adhesion of RBCs to endothelium. 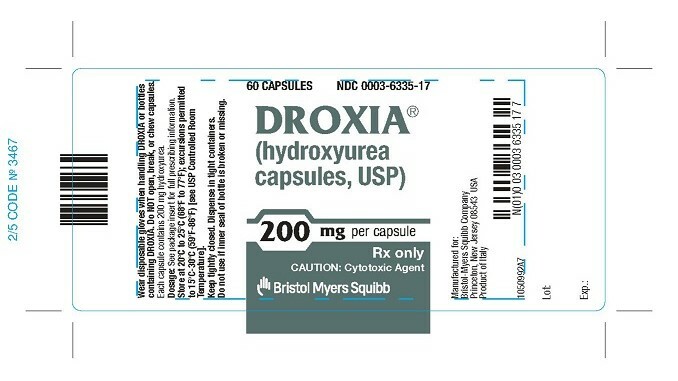 Following oral administration of DROXIA, hydroxyurea reaches peak plasma concentrations in 1 to 4 hours. Mean peak plasma concentrations and AUCs increase more than proportionally with increase of dose.There are no data on the effect of food on the absorption of hydroxyurea. The effect of renal impairment on the pharmacokinetics of hydroxyurea was assessed in adult patients with sickle cell disease and renal impairment. Patients with normal renal function (creatinine clearance [CrCl] >80 mL/min), mild (CrCl 50-80 mL/min), moderate (CrCl =30-<50 mL/min), or severe (<30 mL/min) renal impairment received a single oral dose of 15 mg/kg hydroxyurea. Creatinine clearance values were obtained using 24-hour urine collections. Patients with ESRD received two doses of 15 mg/kg separated by 7 days; the first was given following a 4-hour hemodialysis session, the second prior to hemodialysis. The exposure to hydroxyurea (mean AUC) in patients with CrCl <60 mL/min and those with ESRD was 64% higher than in patients with normal renal function (CrCl >60 mL/min). Reduce the dose of DROXIA when it is administered to patients with creatinine clearance of <60 mL/min or with ESRD following hemodialysis [see Dosage and Administration (2.2) and Use in Specific Populations (8.6)]. Conventional long-term studies to evaluate the carcinogenic potential of DROXIA have not been performed. However, intraperitoneal administration of 125 to 250 mg/kg hydroxyurea (about 0.6-1.2 times the maximum recommended human oral daily dose on a mg/m2 basis) thrice weekly for 6 months to female rats increased the incidence of mammary tumors in rats surviving to 18 months compared to control. Hydroxyurea is mutagenic in vitro to bacteria, fungi, protozoa, and mammalian cells. Hydroxyurea is clastogenic in vitro (hamster cells, human lymphoblasts) and in vivo (SCE assay in rodents, mouse micronucleus assay). Hydroxyurea causes the transformation of rodent embryo cells to a tumorigenic phenotype.Hydroxyurea administered to male rats at 60 mg/kg/day (about 0.3 times the maximum recommended human daily dose on a mg/m2 basis) produced testicular atrophy, decreased spermatogenesis, and significantly reduced their ability to impregnate females. The efficacy of hydroxyurea in sickle cell anemia was assessed in a large clinical study (Multicenter Study of Hydroxyurea in Sickle Cell Anemia) (see Table 2).The study was a randomized, double-blind, placebo-controlled trial that evaluated 299 adult patients (≥18 years) with moderate to severe disease (≥3 painful crises yearly). The trial was stopped by the Data Safety Monitoring Committee, after accrual was completed but before the scheduled 24 months of follow-up was completed in all patients, based on observations of fewer painful crises among patients receiving hydroxyurea.Compared to placebo treatment, treatment with hydroxyurea resulted in a significant decrease in the yearly rate of painful crises, the yearly rate of painful crises requiring hospitalization, the incidence of chest syndrome, the number of patients transfused, and units of blood transfused. Hydroxyurea treatment significantly increased the median time to both first and second painful crises.Although patients with 3 or more painful crises during the preceding 12 months were eligible for the study, most of the benefit in crisis reduction was seen in the patients with 6 or more painful crises during the preceding 12 months.Table 2: Results from the Multicenter Study of Hydroxyurea in Sickle Cell AnemiaEventHydroxyurea(N=152)Placebo(N=147)Percent Change Versus PlaceboP-value* A painful crisis was defined in the study as acute sickling-related pain that resulted in a visit to a medical facility, that lasted more than 4 hours, and that required treatment with a parenteral narcotic or NSAID. Chest syndrome, priapism, and hepatic sequestration were also included in this definition.Median yearly rate of painful crises*2.54.6−46=0.001Median yearly rate of painful crises requiring hospitalization1.02.5−60=0.0027Median time to first painful crisis (months)2.761.35+104=0.014Median time to second painful crisis (months)6.584.13+59=0.0024Incidence of chest syndrome (# episodes)56101−45=0.003Number of patients transfused5579−30=0.002Number of units of blood transfused423670−37=0.003In patients with SCA treated with hydroxyurea, fetal hemoglobin (HbF) increases 4 to 12 weeks after initiation of treatment. In general, average HbF levels correlate with dose and plasma level with possible plateauing at higher dosages.A clear relation between reduction in crisis frequency and increased HbF or F-cell levels has not been demonstrated. The dose-related cytoreductive effects of hydroxyurea, particularly on neutrophils, was the factor most strongly correlated with reduced crisis frequency. DROXIA® (hydroxyurea capsules, USP) is supplied in HDPE bottles with a plastic safety screw cap. Each bottle contains 60 capsules. DROXIA is supplied in the following strengths:200 mg opaque blue-green capsules, marked in black ink with “DROXIA” and “6335” (NDC 0003-6335-17).300 mg opaque purple capsules, marked in black ink with “DROXIA” and “6336” (NDC 0003-6336-17).400 mg opaque reddish-orange capsules, marked in black ink with “DROXIA” and “6337” (NDC 0003-6337-17). DROXIA is a cytotoxic drug. Follow applicable special handling and disposal procedures [see References (15)].To decrease the risk of contact, advise caregivers to wear disposable gloves when handling DROXIA or bottles containing DROXIA. Wash hands with soap and water before and after contact with the bottle or capsules when handling DROXIA. Do not open DROXIA capsules. Avoid exposure to crushed or opened capsules. If contact with crushed or opened capsules occurs on the skin, wash affected area immediately and thoroughly with soap and water. If contact with crushed or opened capsules occurs on the eye(s), the affected area should be flushed thoroughly with water or isotonic eyewash designated for that purpose for at least 15 minutes. If the powder from the capsule is spilled, immediately wipe it up with a damp disposable towel and discard in a closed container, such as a plastic bag; as should the empty capsules. The spill areas should then be cleaned three times using a detergent solution followed by clean water. Keep the medication away from children and pets. Contact your doctor for instructions on how to dispose of outdated capsules. Advise the patient to read the FDA-approved patient labeling (Medication Guide).There is a risk of myelosuppression. Monitoring blood counts every two weeks throughout the duration of therapy should be emphasized to patients taking DROXIA [see Warnings and Precautions (5.1)]. Advise patients to report signs and symptoms of infection or bleeding immediately.Advise patients that there is a risk of cutaneous vasculitic toxicities and secondary malignancies including leukemia and skin cancers.Advise use of sun protection [see Warnings and Precautions (5.2, 5.4)].Advise patients to inform their healthcare provider if they have received or are planning to receive vaccinations while taking DROXIA as this may result in a severe infection [see Warnings and Precautions (5.5)].Advise females of reproductive potential of the potential risk to a fetus and to inform their healthcare provider of a known or suspected pregnancy. Advise females and males of reproductive potential to use contraception during and after treatment with DROXIA [see Warnings and Precautions (5.3) and Use in Specific Populations (8.1, 8.3)].Advise females to discontinue breastfeeding during treatment with DROXIA [see Use in Specific Populations (8.2)].Patients with HIV infection should contact their physician for signs and symptoms of pancreatitis, hepatic events, and peripheral neuropathy [see Warnings and Precautions (5.6)].